Before I came to my current library, there was a dedicated Outreach Librarian position. Unfortunately, with budget cuts it was a position that was not filled after the librarian retired. This really hurt our relationship with local daycares since we could no longer visit them on a monthly basis. As much as we wanted to continue this outreach, there wasn't enough staff time to make it possible. We provide a yearly preschool tour, themed around a book character, for daycares to come visit the library. However, we've realized the logistics of taking a field trip with 15-30 children, under the age of 5, can be a nightmare. The centers have to get permission slips, pay for a bus, and coordinate it around their already busy day. We also offered to come to each center once a year and provide an outreach storytime. While centers took advantage of this offering, they were disappointed that once a year was all our staff could feasible do with our reduced staff. The department decided to emphasize outreach events at the centers when parents were in attendance during this transition period. Attending literacy nights, family days, and more- the department wanted to focus on bringing our literacy message to caregivers in person. Luckily, our boss, Marge Loch-Wouters, developed a great initiative to keep the daycares supplied with books and use minimal staff time. Books2Go debuted in 2010 with 13 local daycares and Headstart opting into the program. A weekly Books2Go cart- ready for checkout! 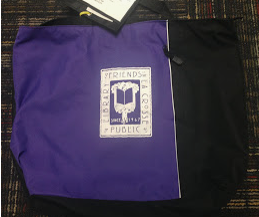 Each month we deliver a bag of 10 books to every classroom. We check out each center's books on a library card that doesn't accrue fines. These cards are only used for Books2Go, and the centers do not know the barcode. We have separate child care provider cards they can obtain if they would like to check out books themselves. Making special library cards was an important way for us to keep track of the number of books each center had, and allowed us to see if any books were missing each month. Advertising- Each month we tried stuffing the bags with flyers for the centers to hang up, upcoming program flyers, or library card registrations. The next month we would find 95% of these items still in the bag. Eventually we realized we were wasting a lot of staff time and money photocopying things that no one was using. Volunteers- Initially we wanted to use volunteers to deliver our books each week to the daycares. However, the majority of our volunteers are retired folks who we quickly realized could not physically lift over 40 pounds of books at each drop off location. Our volunteers also use their own vehicles for insurance reasons, and we quickly realized that this would be asking too much with all of our deliveries. Emails- Most daycare workers are extremely overworked and underpaid. After trying to communicate via email for various reasons we quickly realized that most centers check their emails once a week at most. We've since learned that if we have important time sensitive information to convey (a change in delivery schedule, missing books, etc) we need to call them on the phone. Lost Books- Initially we expected that each center would lose books throughout the year, and we were willing to take this loss. However, we've been pleasantly surprised with how responsible the centers have been. Each center is so excited about this program, even five years later, that they take extra care to have the books ready for us during pick up day. Day Care Relationship- We had high hopes that this monthly delivery service would start repairing the library's relationship with the local day care centers. While they knew we had lost the Outreach Librarian position they were still upset that we no longer could offer monthly outreach visits. This initiative has definitely helped to rebuild those relationships. It has been a great solution so far to our shrinking staff. Circulation- We are happy that this program helps boost our circulation numbers each month, especially as we've been seeing a gradual decease in circulation numbers. We currently serve 17 sites and check out 720 books each month to our centers. That's over 8500 extra books we're circulation each year! Pro: Book Exposure! Making sure that kids in care were exposed to a wide variety of books- both new and classing- on an ongoing basis was key. This was an important change from the book bins that had been left at the centers monthly. Each of the old bins had been developed with a grant over a decade before this initiative and the books shared with the kids were never updates. So providers and kids were being exposed to the same books every year. 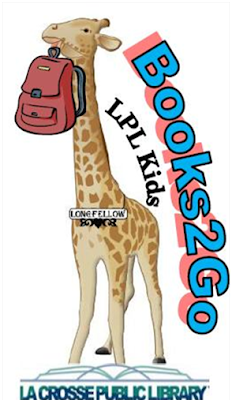 Having fresh books through Books2Go for kids and caregivers to discover was BIG! Con: Adapting- Helping out child care community adapt to a change necessitated by budge cuts (the first of many ongoing cutback) was a big challenge. As a department, we looked at what we could sustain that would provide early literacy benefits no matter what future budgets were like. Do any of you do special outreach initiatives to daycares beyond traditional storytimes? I would love to hear about them! 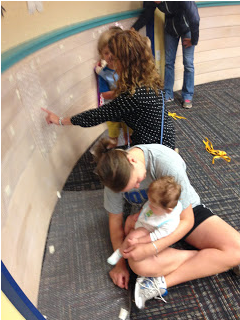 During our most recent storytime break, I decided to hold some fun play groups at the library. I held them two weeks in a row during our normal storytime hour and they were a hit! 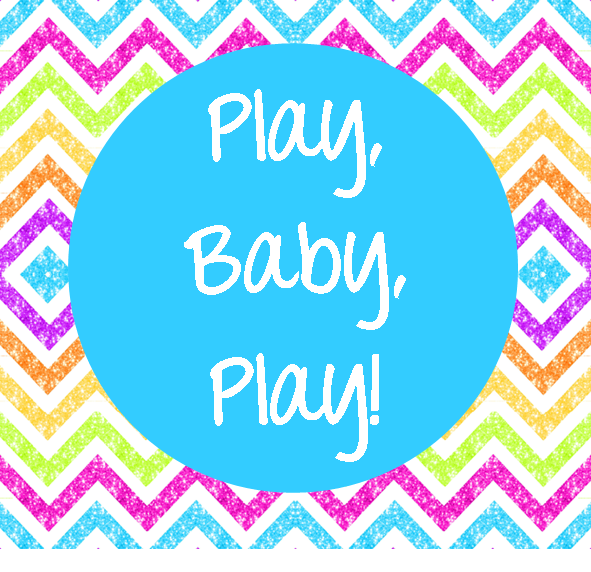 For more fun activities, check out everything Kendra over at Read, Sing, Play does with her babies! Each week I set out a variety of activities for the caregivers to engage in with their children. I tried to make sure that the majority of activity stations I provided were cheap and could be easily reproduced at home. The goal of the program was to encourage caregivers to play with their children, and hopefully continue that play at home. One of the most popular stations was our scarves station. I wrapped tissue boxes in paper and stuffed them full of scarves. Toddlers pulled out the scarves, pushed them back in, and repeated for a long time. Eventually they also realized they could unwrap the boxes too. Even after the first one was unwrapped and it was revealed to be a tissue box, they still shouted "SURPRISE!" every time a new one was opened. Kids are just the best. The bubble wrap wall is everything! The bubble wrap wall was also crazy popular with both kids and caregivers. While some kids preferred stomping on it, others chose to roll. More kids then I expected decided to delicately pop the bubbles throughout the whole program. This is a perfect stations for infants too. I heard amazing conversations happening at the wall about sounds and textures. Start saving your bubble wrap now! Of course, this station was also pretty fabulous. I purchased the pool and the ball pit balls on Amazon, and filled up a blow up pool. I also added cushions to the bottom of the pool because I imagined littles jumping in head first and hitting the hard floor beneath. It was a good decision. I had one kid who literally laid in the pool for an entire hour. Multiple caregivers have come in to share pictures of their own pool pit at home! For this station I simply taped ribbon to the bottom or a table and box. It was a fun tactile experience for little ones as they crawled though it. 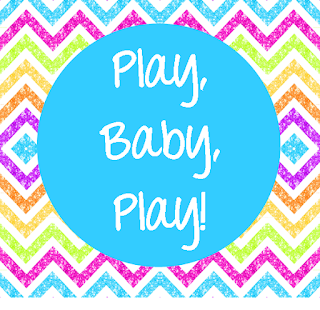 It is also great for imaginative play! Within the first ten minutes it quickly became a "car wash" with children lining up to go through the wash. I had a variety of sensory bottles for littles to explore at one station. I had different objects in each bottle and kids loved shaking them up and watching the changes. I also included these sensory writing bags as an activity. For more information on these, check out my blog post here. Obviously I had to have a station with shaky eggs and dancing ribbons. The dance party music played at a reasonable volume during the entirety of the program. And of course I had a station of comfy bean bags and books for caregivers to read with their kids. This was such a fun program! Other than the ball pit balls (which are obviously reusable), we already owned all of the supplies. We had over 50 participants at each program and numerous requests to add more in the future. It was non-staff intensive, since the stations were meant to be done at everyone's own pace. It allowed our storytime families a chance to chat with one another, plus it helped our circulation on non-storytime weeks.